Checking your water heater power is the first thing you should do if you have an electric hot water heater problem. Electricity can kill you. If you are not confident in your ability to work with voltage please call a professional. Most residential electric water heaters use 240 volts. Their are single element water heaters that operate on 120 volts and single element water heaters that operate on 240 volts. Check the label on your water heater for the voltage rating. 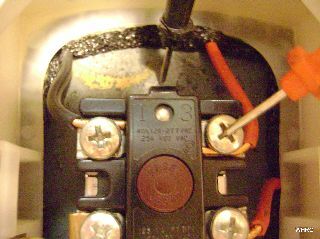 Breakers are usually labeled, however, they can be labeled wrong. It's best to shut off all breakers before removing the access panels. 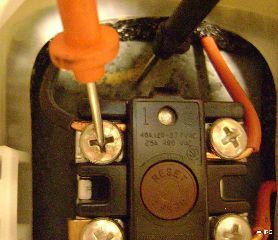 Shutting off wrong breaker - Shut off all breakers until you are sure which one powers the water heater. Using a multimeter that does not work - Always test a meter on an outlet that you know is working. Removing assess panels and insulation with the power on – Exposed wiring is just under the insulation. Shut the power off to the water heater. Remove the upper (top) access panel, the plastic safety cover and the insulation. Power enters the thermostat just above the reset button. In this picture you can see that they are numbered 1 and 3. Each wire is 120 volts when the power is on. Set your meter at 120 volts or above. Place one probe on one of the terminals and the other probe on the water heater tank (scratch the tank with the probe to get a good ground) and check your meter for a reading. You should have 0 volts. If you have voltage, the wrong breaker has been turned off. Check the other terminal the same way. You should not have power on ether terminal. If you do the wrong breaker has been shut off. If you have 0 volts on both sides, the power is off. Turn the power back on. Set your multimeter at or above 240 volts AC. Touch each terminal, #1 and #3, with the meter probes. on one of the terminals so don't touch anything. read 120 volts. If you have lost power on ether side, the problem could be the breaker, or where the wiring connects to the water heater, usually at the top of the tank. 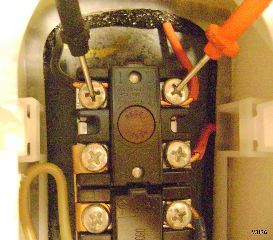 If a 240 volt connection has only 120 volts applied to it, it will read 0 volts on your meter because it has no ground. That is why you must check each side using the tank as a ground. Water heater power reading may vary 115 to 120 volts and 230 to 240 volts.